January is the month of Elvis Presley’s Birthday, which took place on the 8th. It is well known that his favorite sandwich contains peanut butter, bananas, honey, and bacon, which he liked grilled on both sides. I too love the combination of peanut butter and bananas, preferably between slices of whole grain bread. I decided to combine these flavors in a smoothie that I often enjoy after my workouts, or as a quick easy breakfast on the run. In all due respect to Elvis, I couldn’t see how bacon would be something that should be included in my smoothie, so I skipped the bacon and made my thick, rich drink with frozen bananas, a scoop of protein powder, a tablespoon of powdered peanut butter, and a touch of honey. My daughter Christy introduced me to PB2, a powdered penut butter product that has 85% less fat than traditional peanut butter. It is made from real roasted peanuts, a touch of salt and sugar, and can be turned into a spread by simply mixing with a little water. I love the flavor of this product, and have used it in my smoothies and granola bars frequently since I bought it. I like using light almond milk in my smoothies as a 1 cup serving has only 35 calories, but contains 50% more calcium than regular milk. In all of my smoothies I also add a couple of tablespoons of regular oats as well as flax seeds. The oats and flax add fiber and help to thicken the smoothies, while the flax seeds are an important source of omega 3 fatty acids. We always have fruit in our freezer to use in smoothies which makes it easy to create a great tasting, healthy drink whenever we choose. We buy large bags of frozen fruit at Costco, mixed berries being a particular favorite of ours. Also, as soon as our bananas become too ripe for my family to enjoy, I peel them, slice them, and store them in ziploc bags in my freezer to use in this tasty smoothie as well as other flavor combination. 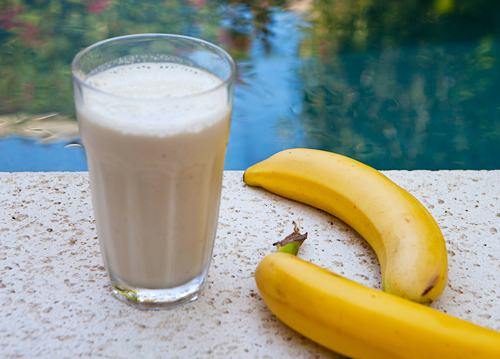 Frozen, ripe bananas are great in smoothies as they add a thick creamy texture when blended and have a lot of natural sweetness. The addition of oats and flax seeds add both fiber and important omega-3 fatty acids. 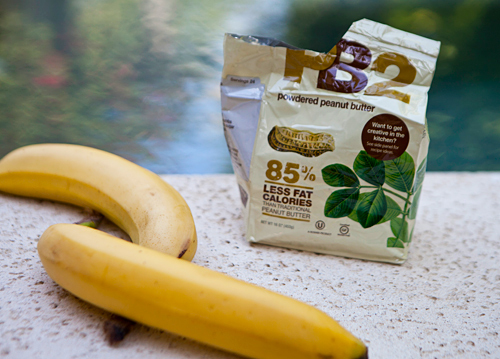 Powdered peanut butter reduces the fat calories without sacrificing flavor. A delicious combination of peanut butter, honey, and bananas in tribute to Elvis. Place everything into a blender and process on high until thick and creamy. Pour into two, large cold glasses and serve. Do you have calorie counts on any of these recipes?? We made the decision very early on not to base our recipes on calories or fat grams as our focus is on rebuilding a healthier life through healthy recipes rather than focusing on weight loss. We try and choose healthy recipes, or we “rebuild” some favorite recipes to make them healthier. We researched many different programs to calculate nutritional values of recipes and found every single one gave different values for the same recipe. Instead of focusing solely on calories or fat, we instead want folks to understand why each of our recipes is healthy.